An offensive smell bombarded the Goodwill Outlet store. Part of the morning duties for the front-end staff involve spraying down the halls. Catching a good whiff can bring me back to my back-end work for competitor Value Village where I’d jump into trailers to salvage donations, receive donations, and clean. 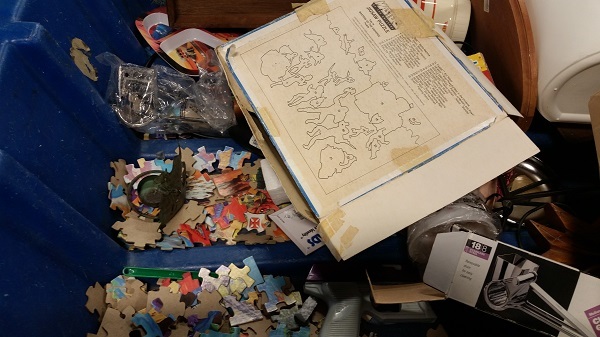 I can’t tell you how many destroyed jigsaw puzzles I swept into the trash. At least one per week, if not daily, because the box wasn’t taped or it fell apart. So that smell was probably the result of a stinker causing this humble piece of pop culture to explode. Scooping up the first one hundred pieces was easy. My pace slowed for the next one hundred. I gained completionist hope as I sifted through this bin and its neighbors in the home stretch. I found all but nine in the bins with one on the ground. Short of asking to look through the trash, I felt defeated knowing that just eight shy was all I could find. My perspective changed after I left the store. Probably the fresh air. I’m glad I could salvage the puzzle. While I try not to be the hero of broken things or an empathetic hoarder anymore, this is the last stop for donations before they’re sold in cloth bundles or trashed, and some of these things are just a little damaged or incomplete. I’m fine with that. I cleared off my workbench to work on the puzzle. If I ever put together a jigsaw puzzle, it certainly wasn’t this complex, or massive at over twenty-two inches by thirty-three inches. The first pass was challenging. I focused on finding characters: He-Man and Skeletor were easiest to find, though Mer-Man and Teela were easiest to build. After a break, I returned for an easier second pass. I almost completed the puzzle, except for those eight missing pieces, in about three hours. I know the process now. Kintsugi popped up in my head the next morning. That’d be a cool build.